Powers/Abilities: As the leader of the Cynodd, Shakata uses advanced technology and necromancy (black magic), often powered by the sacrifice of living beings to obtain their power. He worships Syntropy (pure order) and seeks to use the Synergysts to eliminate all change. Shakata maintains his own genetic material stored in mystically-charged crystals, which he can then have implanted into bodies of other beings, even if they are from other races, to generate a new form for himself. 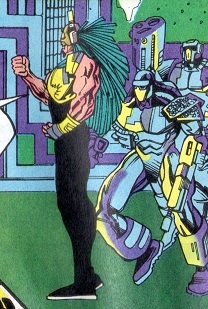 Shakata is experienced in the use of energy weapons, swords, etc., but he typically commands others, such as Dog-Soldiers and/or War-Dogs, and the Zoo to engage in combat for him. (Gun Runner#5 (fb) - BTS) - In ages past, the Cynodd discovered an alien race they called the Synergysts, beings capable of creating fields of syntropy in the matter around them. The Cynodd worshipped them as gods. The Cynodd took the Synergysts in embryonic form back into inhabited space, where they bred them via their genetic talents, educating them in the mystical doctrines of the Cynodd. The Cynodd nurtured the Synergysts to manufacture perfect areas of Syntropy in the places they controlled. (Gun Runner#2 (fb) - BTS) - <According to Gun Runner (Brell) of the Enhanced> - "The Cynodd's infernal war machines carved a swathe of misery and persecution across the galaxy <led> by a monster called Shakata." (Gun Runner#1 (fb) - BTS / Gun Runner#2 (fb) - BTS) - The Vassyr created the Enhanced race of warriors to end forever the mystical threat of the Cynodd and expunge their evil. (Gun Runner#2 (fb) - BTS) - After a long and bloody war, the Enhanced defeated the Cynodd, destroying their armies and machines, and incarcerating their leaders. Gun Runner personally slew Shakata. The Enhanced believed the conflict to be over. (Gun Runner#2 (fb) - BTS / Gun Runner#3 (fb) - BTS) <203 years ago> - An unidentified event incapacitated Gun Runner and his ship/ally Warbird/Oracle, leaving the former drifting and dysfunctional. (Gun Runner#2 (fb) - BTS) - Using their genetic materials stored on crystals, surviving Cynodd or their agents captured homeless people and other transients, using their bodies as the physical template onto which to "clone" their people, including Shakata. (Gun Runner#5 (fb) - BTS) <100 years ago> - The Cynodd burned Vassyra. (Gun Runner#1 (fb) - BTS) - Shakata established a subterranean base on Earth, three kilometers below the Lucky Shoe casino in Las Vegas, Nevada, USA. (Gun Runner#1 (fb) - BTS) - Acolytes to the Cynodd, including Babet (see comments), reported directly to Shakata as needed. 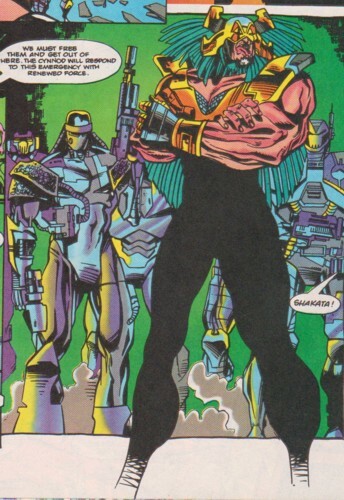 (Gun Runner#1) - After Gun Runner revived on Earth and demonstrated his abilities in Las Vegas, Babet contacted Shakata, noting that he believed he had encountered one of the Enhanced. Surprised as he believed they had rid the universe of the Enhanced centuries ago, Shakata complimented Babet on his good work and prepared to dispatch a strike team. (Gun Runner#1) - The Cynodd strike team ambushed Gun Runner who subdued them with aid from supernatural hero John Blaze. (Gun Runner#2 - BTS) - Gun Runner's ally, Gale Patrec, checked the registration documents of the truck in which the Cynodd War-Dogs/strike force had arrived, determining it to be the property of the Lucky Shoe casino; Gun Runner and Gale headed there to investigate. (Gun Runner#2) - After Gun Runner broke in and took out a number of Cynodd Dog-Warriors, Shakata confronted them with a number of armored Cynodd War-Dogs, after which Blaze and his ally Ghost Rider arrived as well. Shakata explained how they had created genetic duplicates of themselves from human bodies, adding that they could create even more powerful Cynodd using more potent material such as Gun Runner's. Noting the arrival of Blaze and Ghost Rider, Shakata ordered his troops to kill them all, cementing the Spirits of Vengeance's alliance with Gun Runner against the Cynodd. After Ghost Rider and Blaze got the people clear of the area, Gun Runner armed his thermex charges to destroy the entire facility. When he ordered Shakata to surrender, Shakata took Gale hostage, but Gun Runner narrowed his weapon's beam to focally target Shakata, frying his face and helmet, and then fired his charges, destroying the Lucky Shoe casino as he fled with Gale. (Gun Runner#2 - BTS) - Gun Runner stole a Cynodd interplanetary shuttle and took off into space with Gale. (Gun Runner#3 - BTS) - Gun Runner began to seek out the remaining Enhanced. 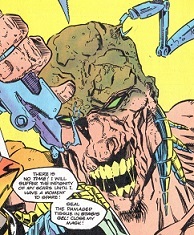 (Gun Runner#3) - From the subterranean Cynodd base, Shakata complained to the Necroborg about the humiliating agony he was forced to endure as it worked to repair his face. At his request, the Necroborg noted that the installation was 74% functional. After the Necroborg reported Gun Runner's escape, Shakata insisted that none of the Enhanced should be allowed to live and that he wished to use their superior genetic material as the basis to restore the Cynodd. When Shakata asked if the Zoo were ready, the Necroborg confirmed that they had been standing ready since Shakata had sounded the alert. After the Zoo entered, Shakata instructed them to hunt down the last of the Vassyrian Enhanced. (Gun Runner#3-4 - BTS) - On the planet Nautilus, the Enhanced Heavy Duty, Gun Runner, and Smith fought off and escaped from the Zoo and a Cynodd ship. (Gun Runner#4 (fb) - BTS) - Cynodd high command annexed the facteroid Isambard for the war effort. (Gun Runner#4 - BTS) - On Isambard, the Cynodd assaulted the Enhanced who fought them off until Oracle/Warbird picked up the Enhanced and departed. (Gun Runner#4 - BTS) - Back on Earth, Shakata and the Necroborg discussed the failures of the Zoo and the Dog Soldiers. Shakata concluded that they had no choice but to advance the processes on Earth, first by activating the Synergysts. The Necroborg noted that the planet was decades away from readiness and that activating a Synergyst now would be -- but Shakata cut it off, telling it he would not tolerate insubordination. 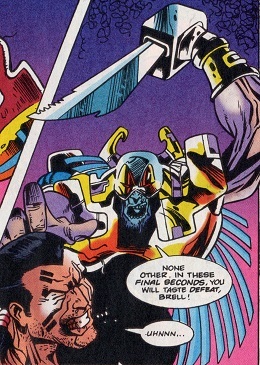 Shakata continued that while it was dangerous, Earth must be secured, and -- if Brell returned to face him -- there was no other way but total Syntropy; he did not care what pains the planet suffered. (Gun Runner#5 (fb) - BTS) - Shakata created or activated another Synergyst, which they manipulated to initiate Syntropy (total order) on Earth. (Gun Runner#5 - BTS) - The damage to Earth induced psychic shock, sending Gale into a coma that would fatally progress. Realizing what had happened, the Enhanced headed back to Earth. (Gun Runner#5 (fb) - BTS) - Shakata predicted that the Syntropic effect would lead the Enhanced back to Earth. (Gun Runner#5 - BTS) - As the Enhanced returned, Syntropy spread outwardly from Las Vegas across the North American continent. Unable to get closer than 400 miles or risk syntropy herself, Oracle teleported the Enhanced to Earth. Detecting the Enhanced's arrival, the Zoo prepared to battle and destroy them. (Gun Runner#6) - With Syntropy threatening to engulf Earth within hours, the Zoo confronted the Enhanced. Heavy Duty blew a hole in the Syntropic shell via a thermex charge. The Zoo pursued the Enhanced as they went through the hole and headed underground. Back on the Warbird, the Syntropy-maddened Gale (acting as a Cynodd killing machine) confronted and was subdued by Oracle. Shakata assaulted Gun Runner as he approached the Synergyst, but Smith, who had secretly followed Gun Runner, took out Shakata by impaling him with a spear. (Gun Runner#6 - BTS) - Gun Runner apparently destroyed the Synergyst with rapid fire and/or thermex charges. Comments: Created by Dan Abnett, Andy Lanning, Terry Clark, and Adolfo Baylla. One of the Cynodd Strike Team called to the group leader, "Speggly" (or perhaps "Speggly" is a curse or invocation of some sort). It's hard to say, because I think the Cynodd that said "Speggly" was the last man standing of his group, but maybe he didn't know that? Thanks to Markus Raymond for providing the main image. My issue was water damaged. A synod is a council of a church, usually convened to decide an issue of doctrine, administration or application. The word synod comes from the Greek word meaning "assembly" or "meeting", and it is synonymous with the Latin word concilium meaning "council"
SHAKANI - Fall People, with Nereel, coaxed Colossus into ritual of new life--X-Men I#115?